Google is the biggest search engine. It is more famous than Bing and Yandex.com. Most people do not know about several services of Google. When they search his requirement on site, they find that some services may be easiest his work online. Google alert is one of the services, which provide the update about the latest news, technology, politics and other fields. To know the updated information, you can opt the alert on Google. You will not receive only information but will get some cool stuff. Basically, the news and entertainment stuff served by Google is unique and update on time. They choose the best stuff for you. Google will promptly send the message by mail and alert with notification. To receive the Google message, an E-mail is required of you. This the best tools and creation of Google to provide Video, News, Blog alerts in the single click. First of all, you have to select a particular keyword of your content to search the subject and second a mail id required. You have to go with link Alerts now you have to the given keyword in search option to opt your best stuff. Next, you will give E-mail id in Create alert option. Another option can choose for flexibility to serve the content according to your convenience. The option is given ‘How Often’, ‘Source’, ‘Language’, ‘Region’ and ‘How Many’. You have to only select for your convenience. The collection of stuff will serve by Google from Blog, Web, Facebook and Youtube content. 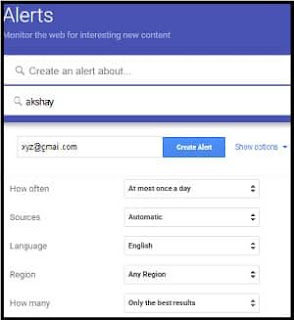 To start this service, just fill the information in search option and provide the email id, now press Create Alert option. You are ready to receive the new stuff from Google. Some details have flashed in the image to know better.